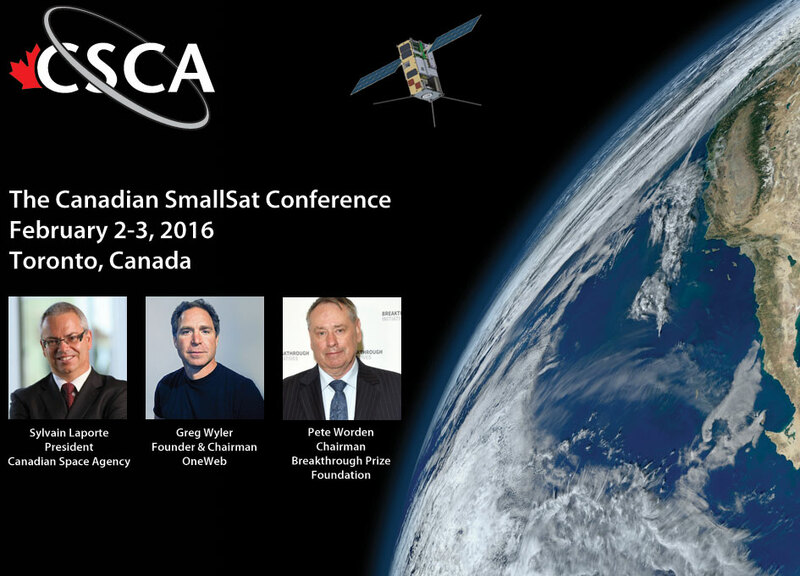 The Canadian SmallSat Symposium 2016. Credit: CSCA. The advent of small satellites is not new. For several years small satellites have been on the rise. However, 2015 can be seen as the year small satellite constellations leapt to the forefront of the news with the announcements by OneWeb to launch 900 small satellites and SpaceX to launch up to 4,000 small satellites. By no means are these the only two players in the smallsat constellation business. They are however getting their share of publicity. There are smaller efforts underway as well. In fact, Planet Labs out of Silicon Valley, has already launched over 100 earth observation nanosatellites. What is small satellite? Typically, and their is no set standard, small satellites, or smallsats, are defined as those weighing less than 500kg. The OneWeb constellation with its 900 satellites will see the size come in at around 125kg. Planet Labs satellites come in around 4kg and can be classified as nanosatellites. In Canada, the Space Flight Laboratory in Toronto, affiliated with the University of Toronto Institute for Aerospace Studies has been for years leading the way in nanosatellite development in Canada. The lab which builds and sells small satellites globally, but on a small scale, also serves as co-op like venue for students at the University of Toronto. The combination of commercial with educational component has served it well. Former Space Flight Laboratory employees are now working for new space companies such as Canadensys Aerospace of Bolton and Deep Space Industries of Silicon Valley. Because of the growth and demand for small satellites, the Canadian Space Commerce Association decided earlier this year to host its first Canadian SmallSat Symposium this coming February 2nd and 3rd. The symposium is about opportunity, building capability and international partnerships. The symposium has attracted some high profile speakers including Canadian Space Agency President Sylvain Laporte, OneWeb Founder and Chairman Greg Wyler, Pete Worden, a smallest pioneer when he was with the Air Force and NASA and who is now Chairman of the Breakthrough Prize Foundation and Robert Zee the Director of the Space Flight Laboratory to name a few. The symposium is also scheduled to have a mini-student component designed to bring students together to learn from each other and to interact with industry and other stakeholders like government. The Canadian Space Commerce Association is hoping for upwards of 150 people to attend this inaugural event and plans to follow up the event in 2017. There are still a few days left to submit an abstract for those interested in speaking at the symposium and early registration is underway until December 23rd. The event is being held in downtown Toronto at the Novotel Centre Hotel with a discounted rate for attendees. More information and registration is available from the symposium website at this address: https://smallsat.ca.